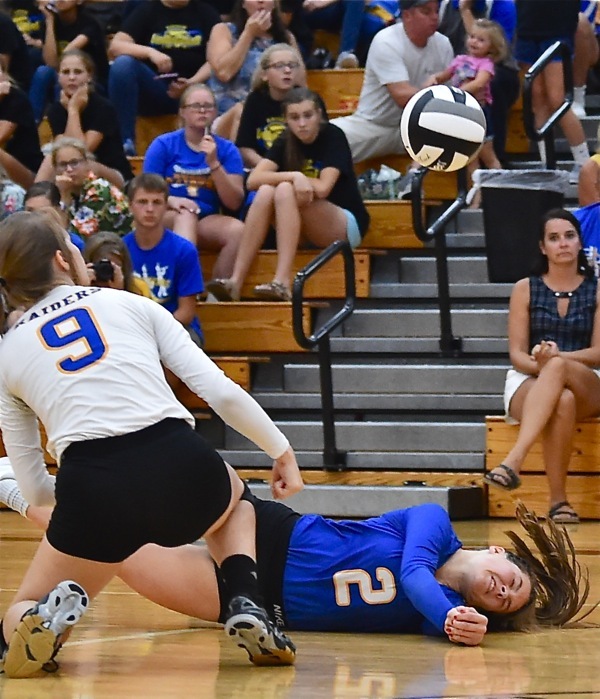 Russia’s Stunning Comeback Crushes Loramie, 3-2…..
Left for dead after the first two sets, the Russia Raiders staged an improbable, and stunning comeback over the next three to overtake and beat Fort Loramie, three sets to two. 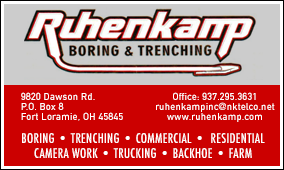 Fort Loramie – There’s an old and well-used axiom in sports that says…you never let a beaten opponent hang around, because, they might just figure out they have life left and come back and beat YOU! Which is exactly what happened in Fort Loramie Tuesday night. The Russia Raiders, down two sets to none, somehow aroused themselves in time to negate the sweep, took their first lead of the match at 23-22, and ultimately won the third set, 27-25. It was like someone flipped the switch! From there on they took the next two sets, easily, and won in crushing fashion, 20-25, 20-25, 27-25, 25-16, and 15-12. “I have no idea how it happened,” said Russia coach Aaron Watkins, shaking his head outside his locker room afterwards. “All I can say is they let us hang around, and I told the girls afterwards that we can’t like playing five sets as much as we are. They let ’em hang around, yes. Loramie took it for granted after winning the first two sets in the manner they did, yes. Russia never led in the match until 23-22…IN THE THIRD SET! And Redskin coach John Rodgers would later say that their youth and inexperience took over in the final two sets. Russia’s Ashley Scott pushes a point past a pair of Loramie defenders in Tuesday’s comeback win. But give some credit to Russia, as well. 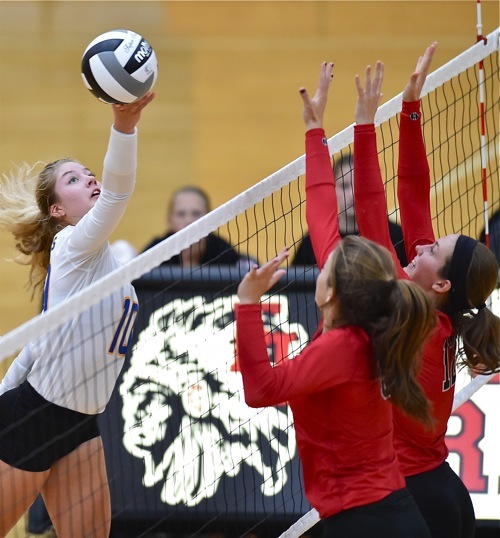 After beating Division III champs easily on Saturday in straight sets, Watkins’ Raiders were resourceful enough to be lousy for the first two sets Tuesday…yet lustrous enough to win over the next three. 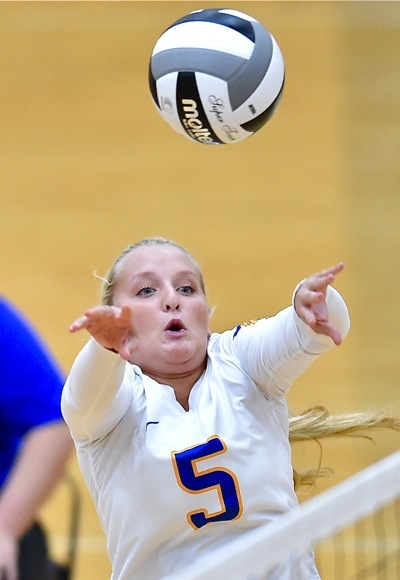 Almost on cue, the Raiders’ sophomore libero popped out of the locker room, and after doing her best whirling dirvish imitation for five sets…did her best to put perspective on their improbable win. It’s inexplicable, really, how momentum can change like that – in the proverbial bat of an eye. 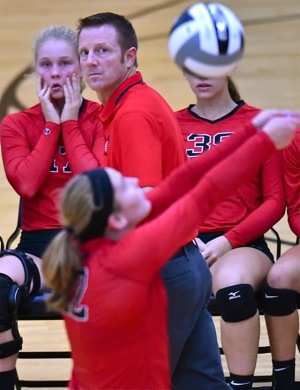 Because even in the third set Loramie had what appeared to be a commanding lead, 23-20, in the manner in which they had won the first two games. Morgan Wenrick saves a point in the Raiders’ 15-12 deciding set win. And the stress of the moment, to use Kendall Monnin’s words, came calling on Loramie youthful lineup. “That fourth and fifth game…our youth was bound to show at some points,” added Rodgers. “I think we got rattled a bit. I think we became tentative – afraid to make mistakes. We don’t yell, we just just keep going. But it frustrates me when we had a chance to put them away and we didn’t take advantage of that. For Russia…Ashley Scott finished with 12 kills. But the glaring number was the ‘dig’ stats for Kendall Monnin (22) and teammate Jenna Cordonnier (18), who continues to play at an extremely high level. Cordonnier punctuated her night, as well, with a team high 25 assists. For Loramie…Ana Sholtis and Marissa Meiring each had 10 kills, while Aleah Frilling and Maya Maurer and 21 and 13 assists, respectively. Meiring also had a team-high 20 digs, while teammate Emily Austin added 11. The look…when things aren’t going right after losing a two-set lead. The win raises Russia’s record to 3-2, with back-to-back wins now over Versailles and league rival Loramie. The loss drops the Redskins to 3-3. Russia will now play Anna on Thursday, and participate in a Saturday event with three others teams against St. Henry, at St. Henry. Loramie has a road date at Houston on Thurday before returning home this Saturday to face Versailles. If that’s true, they must have had a heckuva’ day at Russia on Tuesday – like all-day algebra. And still, they won. You can…if you hang around long enough!